← I laugh at WANNABES! We will be kicking off the first phase of membership drive. For now, the club will operate fully over the Cyberspace/Internet. And what that means? The membership fee will be waived for now. Yes, it will be totally FREE during this period! As a member, you will get periodical newsletters with tons of information and fun! Hi there, I’m looking to move to Malaysia at the end of next month and I’ll be bringing by rabbits with me. I’m having problems getting the info I need including contact details to obtain the information. I wanted to know if there is Mytoximacosis and VHD in Malaysia? It’s bad enough that I have to give them a rabies vaccine and they would have to pre-order theese other vaccines if required. A pointer or contact details would be a huge help. By the way, I’m SO glad to see this group exists, I shall deinitely join. Thanks in advance for any assistance you can provide. I suspect that my rabbits have either VHD and Myxo because they are dying off one by one. I am looking forward to find the vaccine but most of the local vet said it’s not necessary and no vaccine for rabbit. Anyone know where to get it? Hi Jean, are there any symptoms? You can try your luck with the veterinary services department to see if they have the vaccine available. I highly doubt it since VHD & Myxo are unheard of in Malaysia or there isn’t any outbreak serious enough or rabbits are just worthless in the eyes of the authorities. Hope your rabbits stop dying. Hi, Jean–as Director of the Rabbit Industry Council, I’m very interested in hearing more about what you are seeing. What symptoms, how much time between deaths? What are you feeding/watering with? What breeds and what ages are affected? RVHD is an OIE-reportable disease, so the Veterinary Services should be reacting with a bit more enthusiasm–contact your area’s government veterinary chief and if necessary, their superior in the agriculture and veterinary services. 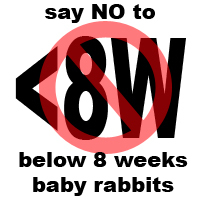 Don’t let them pass rabbits off as unimportant! This disease (Rabbit Viral Hemorrhagic Disease) is very very nasty and can easily wipe out a majority of rabbits in the area. animals that are young may be ill but recover to become carriers for at least 1 month post-infection. Death is sudden and may be accompanied by a scream and/or bloody discharge from the nose, mouth, eyes, or rear. Losses are numerous and unaffected by ‘regular’ treatments such as antibiotics. Necropsy findings include hemorrhagic lungs and liver with a reticulated pattern of hemorrhagic damage. PLEASE DO NOT VISIT ANY OTHER RABBITRIES until you find out for sure what’s going on, and bleach your tires and shoes before and after going to the feedstore or other areas where others might pick up the virus (if that’s what it is). It is very very tenacious and tough! Go to http://www.showbunny.com/RVHD/index.html for the full outline of the outbreaks in the early 2000’s in the US; the data there is likely to be quite helpful. Hi, I am movng to Malaysia from UAE soon. 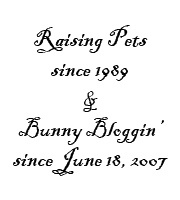 I have two rabbits (my babies) european breeds, that I hope to bring with me. My searches on the internet haven’t yielded clear results on who I can contact or where I can get up-to-date and comprehensive information on importation. I was hoping you could point me in the right direction as I need to sort out their rabies vaccinations and other paperwork in the next month or so. Thanks.